Many thanks to those who have read my books on the Dyers and have posted reviews in Amazon and Goodreads; thanks as well to those who have shared the links via social media, to the paperback and Kindle editions of the books. Mary Barrett Dyer was executed in 1660 for running afoul of the religious authorities in Colonial America (which, to be fair, wasn’t hard). 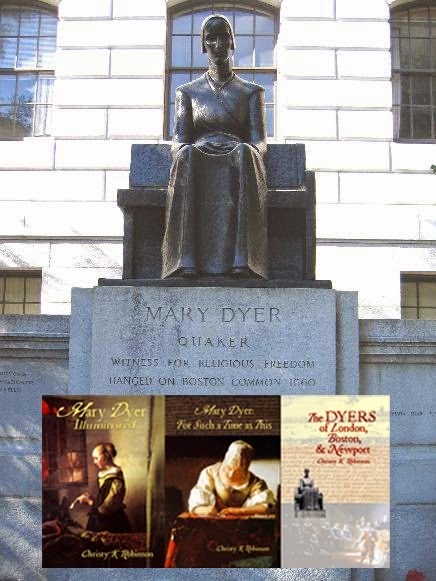 If you know your Colonial America, you may know Mary Dyer’s name as a pioneer of religious liberty. 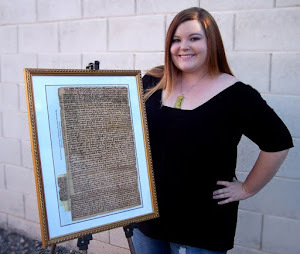 She’s also an ancestor of writer Christy Robinson, who has spent the last several years researching the lives of Mary, her husband William Dyer, and the worlds in which they lived both in England and after emigrating to America. This novel, which explores Mary’s early years, is as meticulously-researched a piece of historical fiction as I’ve read in a long time. It’s heavy on the history and light on the fiction in the sense that Robinson is not a writer who would knowingly contradict a historical fact or oversimplify the complex webs of colonial-era religion and politics. However, the fictional touch is required to bring the personal elements of the story to life, to flesh out Mary, William, and other people they knew (including Mary’s more-famous, but not martyred, friend Anne Hutchinson) into real people. Robinson does this skilfully, using everyday detail to, as the title suggests, illuminate a biographical sketch into the story of a vibrant and memorable human being. Reading this novel made me eager for the next volume, which will follow Mary through the later years of her life. 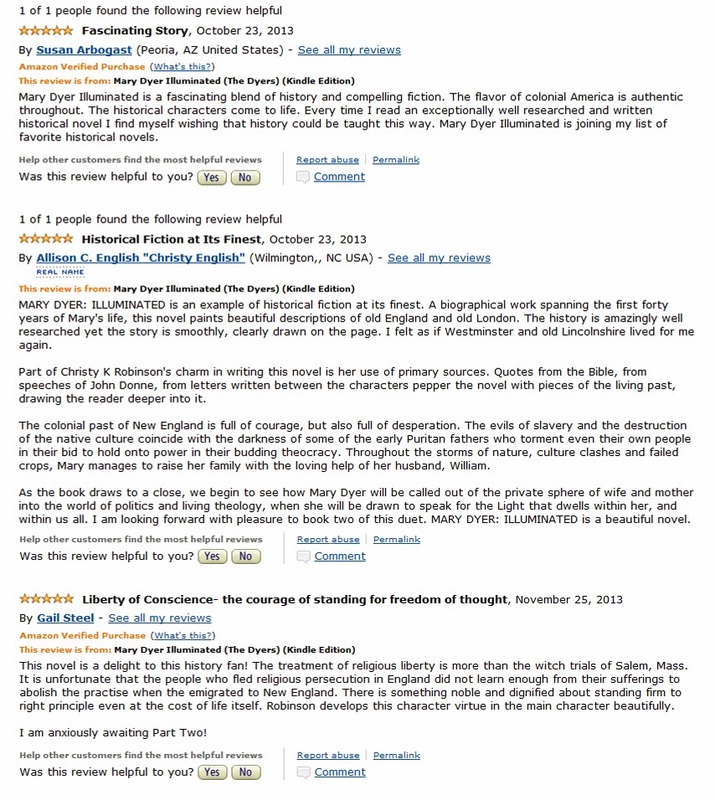 Here are some recent screenshots of other reviewers' thoughts on the book. 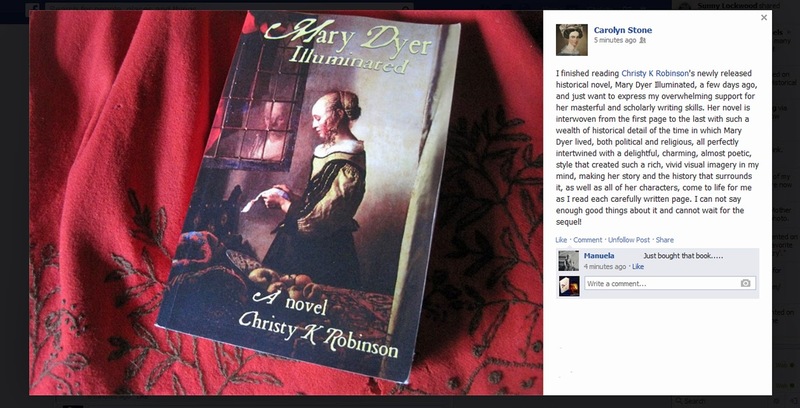 Christy has done an incredible job of bringing life in 1600s England and New England to life in her historical novel Mary Dyer Illuminated. I wish that she had written this book years ago when I was still teaching high school history classes. The depth of information that she weaves into her story-telling makes it easier for us to understand the struggles of life nearly five hundred years ago. Christy's gift includes bringing the issues of religious freedom and the rights of women to the center of her story. For most of us, if we knew anything about Mary Barrett Dyer, our knowledge was limited to the fact that she was a Quaker who was hung in the Puritan-controlled Massachusetts Bay Colony. Her story is so much more than that, and Christy brings Mary's full story to life. Along the way, Christy weaves in excellent explanations of the nuances of the theological, political and economic issues of the day. She helps us understand the difficulties in creating a new civilization in New England. 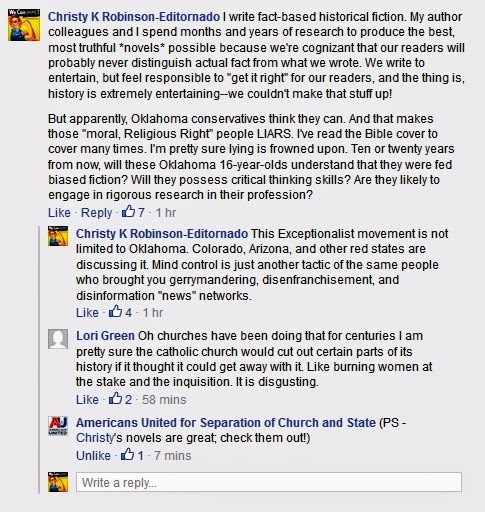 But none of this interferes with her telling Mary Dyers' story. For those of us who have ancestors from the seventeenth century New England, Christy brings these people to life and gives us a chance to understand the issues that they faced daily. I heartily recommend this book to anyone who is interested in the issues of religious freedom and the rights of women. 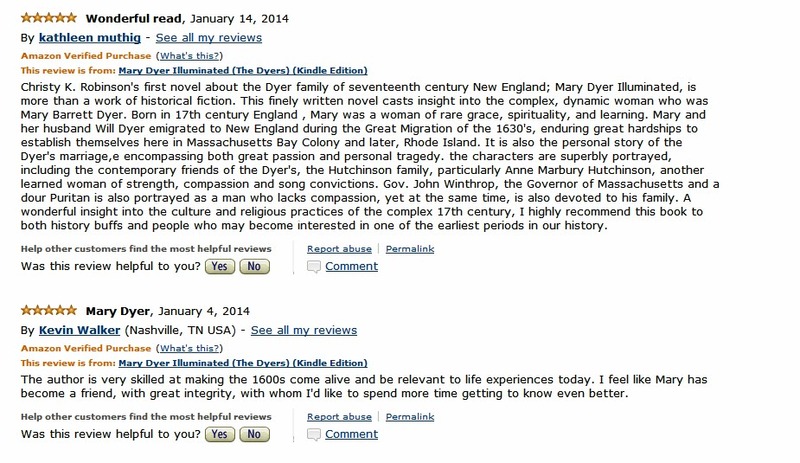 Those who want a better understanding of founding of the colonies in New England will also be satisfied. June 29, 2014 By Anna M. Waters "Old Great Grandma"
Anyone who has an interest in the early settlers of our country will find this book to be full of history. There were a few parts where many names were mentioned that I did not find interesting, but others probably would. The story line was extremely interesting, and to read of all those folks went through, well, you just have to read the book. I think you will enjoy it immensely. 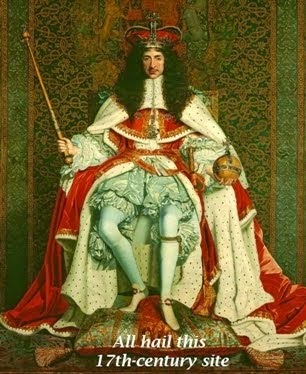 I enjoy reading historical fiction. I like reading about history with an author's freedom to give me some insight to what might have been going on in a person's mind which would put meat on the story. Christy K Robinson researched her subject in depth. This was an engaging way to learn some history. I bought the book because the author and I attended the same secondary school and connected on an alumni site. I will recommend this book to others. 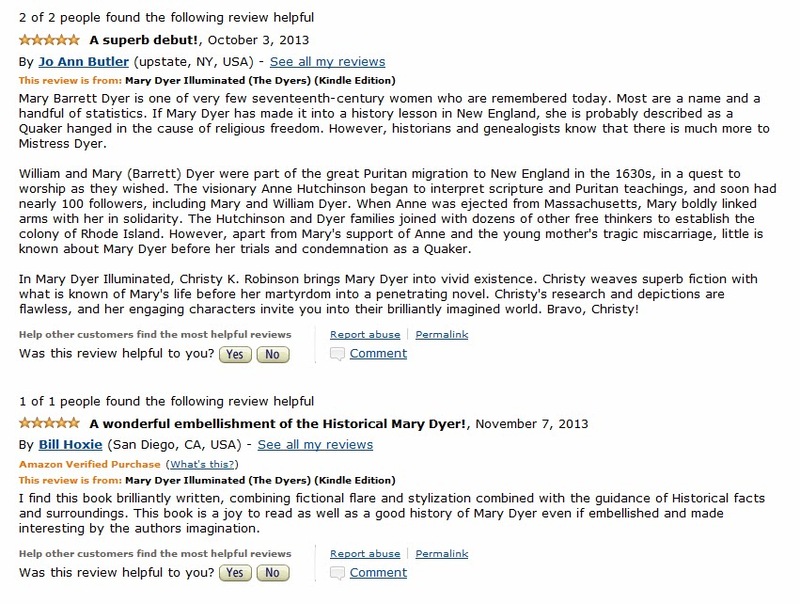 I had never before heard of Mary Dyer, but Christy brought her to life for me in this book. Besides an appreciation of Mary Dyer herself and her commitment to her beliefs, I now also have a much clearer understanding of life and politics in the 1600's in America. Mary's story is compelling and very well written. I can't even comprehend the amount of thought and research required to put together a book like this and make it an interesting read. Wonderful job! Even though we know the end to Mary's story, I found myself tied to watching the events unravel with an anxious expectation. A belief worth having is one worth dying for. May we not forget the lesson taught by marrying the civil with the spiritual and appreciate the concept of freedom of conscience. In Book Two, Author Christy K. Robinson once again breathes life into the characters of William and Mary Dyer as she expands the story of the start of religious liberty in the United States. Mary Dyer: For Such a Time as This, is a fascinating historical novel that brings to light the horrible persecution of people who didn't subscribe to the exact religious beliefs of those in power in the colonies of the 1630's. The Puritans, then in power in Boston, were quick to jail, whip and even destroy those who were Baptist, Quakers and/or even people of no religious beliefs. Mary Dyer's life and subsequent death shed light on their persecution and caught the attention of the Crown in England, resulting in those persecutions being ended, as well as opened the door for the subsequent separation of the powers of church and state in the Colonies, which, a hundred years later were written into our Constitution. Mary Dyer: For Such a Time as This is a must read for anyone wanting to know more about the history of the freedoms that we enjoy in the United States. I love these books. The series of the Dyers is very interesting. I enjoy history and family history. I get both in these books. I learned so many things that I wasn't taught in history classes at school. Mary Dyer was an amazing and strong woman. Her death was tragic and so unnecessary. I am so ashamed of the people who caused her death. She did not as far as I am concerned. Our personal liberties are so important. I am proud that she stood up with hers. The separation of church and state as explained through Mary's story is so different from what we are told in public schools. 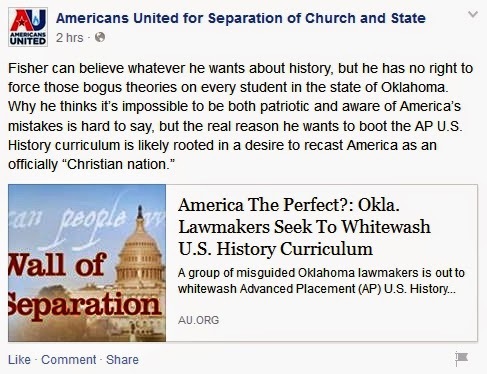 Maybe that is why I am an elected official at the Ramsey Conservation District in Minnesota as well as an ordained Minister. I hope that Mary finds pride in that. I am looking forward to many more books in this series. They are a wealth of information and pure enjoyment. The books are fairly think but once I started. I didn't want to put it down. I take mine every where and read whenever I get a chance. They are definitely full of mystery, intrigue and facts. Christy K Robinson's non fiction book about Mary Dyer and her family is an excellent edition to her historical novels , Mary Dyer Illuminated, and Mary Dyer, For Such A Time As This. Mary's extraordinary life and her contribution to the adaptation of our Bill of Rights is thoroughly explored by Ms. Robinson, who also happens to be her descendant. If you are a fan of 17th century history like me, and thought you knew Mary Dyer's incredible story, think again. 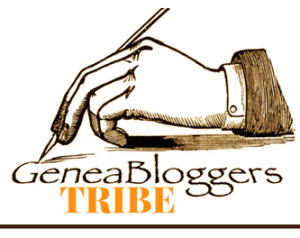 This is a must read for fans of both nonfiction biographies and historical novels. Mary was an exceptionally intelligent, eloquent, and brave woman, and a light in the midst of a dark time in what would eventually become American history. If you feel rushed & harried by today's hectic, demanding lifestyle, this is the daily devotional book for you! It's an easy read, just spiritual enough to inspire you but not so theologically involved as to make you want to skim over its pages without investing in their messages! 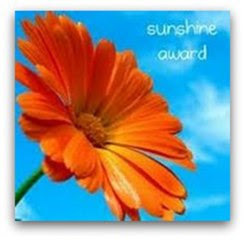 The author was skilled at combining humor, inspiration, and hope with God's word. I highly recommend! Its so affordable you can buy a copy for yourself, your family members, and your cherished friends. At first I thought okay I am going to read as a favor to the author. But after I started to read it, I was no longer reading it because I had to but because I wanted to. This book really spoke to my heart and by reading it I truly felt that I had been changed in someway. Thank you for this book! I was looking for really different and I found it in this book. It kept me turning the pages and made me look at things differently. I would recommend it to others. The daily devotionals were powerful, authentic, and applicable to today's living. Although all of the contributers have written useful devotinals, and it is well edited. The ones which Ms. Robinson personally wrote are truly outstanding. I highly recommend this accessable and relevant collectin of devotionals.